When inserting a sub-assembly into an assembly, I believe a check box to "group" the sub-assembly as part of the insert process would be very helpful. When creating a mate, the entire sub-assembly would move together. I think of the sub-assembly as a unit, and I want to move it as a unit. I have not had a design where I wanted to insert an assembly and then moved only some of this assembly elsewhere. This option would keep the current workflow, and add a useful option for people to choose. @david_ruggles ; subs assemblies will maintain the mates added at their own level. If you insert an entire part studio, those parts do not act as a unit. Are you asking for an auto group on a part studio insert? 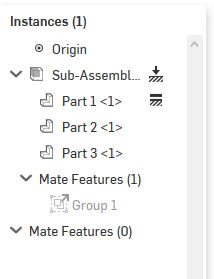 lougallo, I am asking for the option to auto group (or option to group) on a sub-assembly insert. The sub-assembly uses multiple fixed mates. These fixed mates disappear when inserting the sub-assembly. The reason for fixed mates is to fix each of the parts from one part studio as the base for the sub-assembly. These seems like a reasonable design path. The work around is to mate each of the part studio parts together and only use the fixed mate once. @david_ruggles I may be wrong, but I think you are making a mistake that I also made when I first started using Onshape. You should only really fix one part in the sub-assembly and group the rest with that fixed part. When you insert that sub-assembly into a new assembly they will remain grouped. This very well may be my mistake. My Onshape skills have a ways to catch up to my other CAD expertise. It still seems like extra work for me to create parts in a part studio that are designed to mate together, then mate them together. Fixing these parts in place, then putting them in a next higher assembly made sense to me. 1. Could you comment on how you normally do this kind of design work? 2. Also, could you comment on when you have or would insert a sub-assembly that should not be grouped as one entity? 3. The "group" command of all my sub-assemblies makes sense to me. Could you comment why this is not a good idea? Think of the part studio as a place to design parts and where related parts can be designed in the same workspace and share features. An assembly is where you put those and possibly other parts together and define their relationships to each other. In the case of your test assembly all you need is to insert the parts in place with the green check mark. Once the parts are inserted you will fix one of the parts, usually I will pick whichever one I consider to the be the main part. After that you will highlight all 3 parts and group them. Since the first part is fixed and the other parts are grouped to it, none of the parts will be able to move in the current sub-assembly. When you insert that sub-assembly into a new assembly it will maintain the grouped relationship. If you want to use the sub-assembly as a jumping off point for more assemblies you can fix it in place, by expanding it in the tree, right clicking one of the parts and fixing just that part. I think that should answer all your questions. @Cris_Bowers, Thank you for answering these questions. This quote below is the key idea I was missing. I needed to make changes to the "sub-assembly" to fix one part then group everything here. Then next higher level assemblies will treat the sub-assembly as one unit. Since the first part is fixed and the other parts are grouped to it, none of the parts will be able to move in the current sub-assembly. 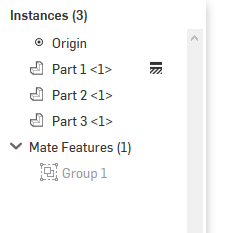 @Cris_Bowers, I now understand why @lougallo was asking about automatic grouping when inserting the Part Studio into the "sub-assembly." Do you think this automatic grouping would be helpful?